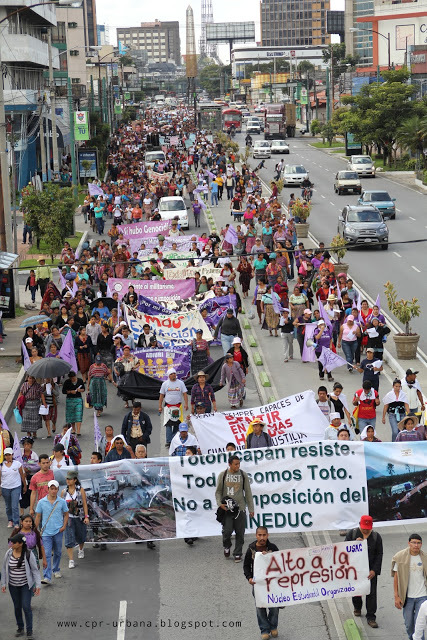 On October 4th, members of K’iche’ communities from Totonicapán, Guatemala, held a peaceful protest to speak out against the government’s recent educational ‘reforms’, rising energy prices, and the increased militarization of civil society, and to call for change. During the protest, members of the military, reportedly ignoring orders to maintain their distance, tried to break up the road block and fired into the crowd. At least six people were killed (some have reported eight) and over 30 more were injured. You can read more about the Totonicapán massacre on the NISGUA blog, and at Upside Down World. On October 11, the Guatemalan Attorney General announced charges against an army colonel and eight soldiers implicated in the massacre, which Human Rights Watch cited as an important first step toward accountability in Guatemala. On October 12, only days after the U.S. government celebrated Columbus Day, Guatemalans observed a nation-wide Day of Indigenous Resistance. During an organized march, participants demanded — among other things– justice for the victims of the attack: José Eusebio Puac Barreno, Santos Hernández Menchú , Jesús Baltazar Caxaj Puac, Arturo Félix Sapón Yax, Jesús Francisco Puac Ordóñez, Rafael Nicolás Batz, and all those injured. Please stand in solidarity with our sisters and brothers in Guatemala and keep international pressure on the Guatemalan government to bring those responsible to justice and to ensure that such acts are never repeated. You can sign a petition created by the Guatemala Human Rights Commission here. This entry was posted in General, Guatemala and tagged Central American news updates. Bookmark the permalink.